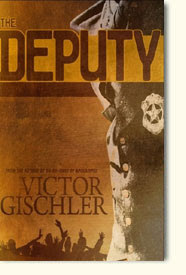 I want to sincerely thank all the new readers who have given THE DEPUTY a try. 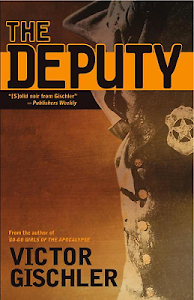 After last week's big publicity push, a ton of you downloaded THE DEPUTY on kindle to give it a read, and the results have been great. You're awesome. If you enjoyed the book and would like to be sprayed with hot buttery karma, then send a hundred friends right here to get a copy of the novel so they can try it for themselves. Thanks again! Help an author ... and it won't cost you a dime. Folks, I've been pushing my novel THE DEPUTY the last few days. A lot. Why? Because it is FREE on Kindle and Nook right now. You're probably wondering how that helps The Gischler. Steady on. I'll explain. But first let me express sincere gratitude to those of you who actually paid money for this thing. When the novel first came out, you reached into your own pocket and paid the going rate for a paperback or hardcover or eBook. You rock. I luvs you and that's for reals. But THE DEPUTY is not a shiny new book anymore, and the recent FREE sales promotion is a chance to breathe new live into the novel and get it out to more readers. I've talked to my publisher Tyrus/F+W Crime who explained that giving the novel away for free really is a good strategy in the long run. It helps build interest and momentum. So by getting a copy for free, you are helping me. Give it as a gift. Use the Kindle app on your Droid or iPhone. Spread the word. Hey, it's free. No risk to give it a try or to harass ten friends to give it a try. Get it anyplace they provide eBooks on any format, but mostly on the Nook or on the Kindle. And if you have a free or cheap eBook you want to promote, then leave a link in the comments and tell us about it. I don't mind sharing my stump. The Triumphant Return of EMERSON LaSALLE! Folks, it's been a long time coming, but at last Emerson LaSalle is back! Pulp legend LaSalle is the author of over 400 novels and 1200 short stories and continued to write up to his death in 2007 when he was fatally mauled by a bear outside his cabin in Calamity, Idaho. LaSalle is famous for saying "technology is ruining science fiction" and embraced the often derided term "sci-fi." 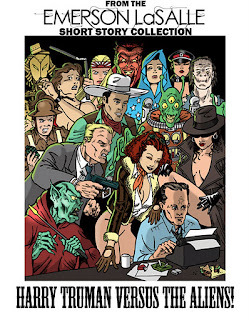 Now, you can introduce yourself to his work with this .99 cent short story "Harry Truman vs The Aliens" available on kindle. Go. Buy. Hurry. "Just ... no." New York Times. "I feel dirty and betrayed." St. Louis Post Dispatch. "It is everything that is wrong with Science Fiction." Washington Post. See that picture of a spaceship? 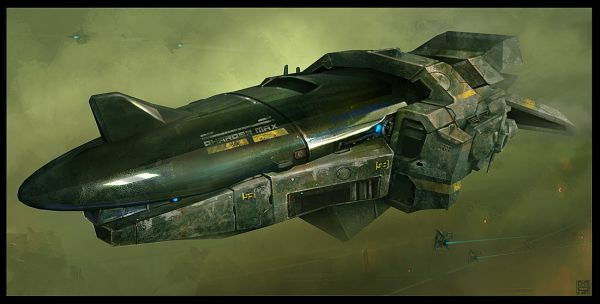 That's just to put you in a sci-fi mood. Because if you come see author guest of honor David Brin at CONtraflow in New Orleans this weekend, you can also find me hanging around cluttering up the place too. I'll be happy to sign books and drink beer or do a little dance. Whatever pleases thee. I'll be on some panels and junk. See you there. 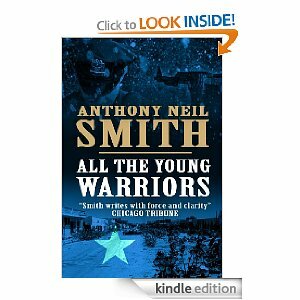 Here at Blogpocalypse, it's my pleasure to occasionally pimp for pals, and my pal Neil has written a new winner, a novel called ALL THE YOUNG WARRIORS. 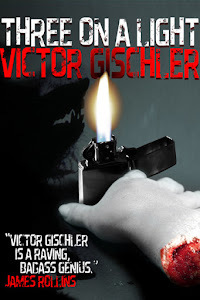 This is an eBook with the new Blasted Heath Press, a publisher specializing in eBooks. No print. Print is on the way out? Maybe. It doesn't matter. Today's important message is GO BUY NEIL'S NEW NOVEL!